What Is Stem Mastering ? Firstly let’s imagine the ideal scenario: mastering a really good stereo mix. You have as your starting point a flat mix which represents the very best modern recording techniques have to offer; it’s got headroom, a good signal-to-noise ratio, a full and natural frequency response, and most importantly a perfectly balanced blend of well recorded instruments and/or voices. Your mastering engineer’s objective is to iron out any minor humps, bumps or holes in the frequency spectrum, glue the mix together or add impact with some compression maybe, and generally make sure it sounds at least as good out there in the real world as it did to you in the mix studio when you laid it down. In our ideal-world example this is of course no problem at all. Let’s say you decide it would benefit from being brighter: your mastering engineer reaches for his sweetest sounding Mastering EQ and adds some top, and consequently the cymbals have more sizzle, the snare has more snap, the vocals have more air, the guitars more presence and the keyboards have more sparkle. That’s the ideal scenario, and frequently mastering sessions go more or less along those lines. However there may be aspects of your mix that you’re less sure of; for instance, what if you want to brighten up the vox and guitars but the cymbals are too bright already? You could go back to the mix studio for a recall, but it would be so much easier if you could simply EQ those elements separately at the mastering stage. 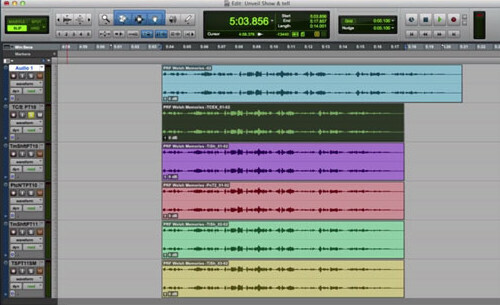 The idea of using stems is to give you exactly that kind of flexibility. Instead of coming to the mastering session with your mix in the form of one stereo file, you have it in the form of multiple files so that different elements of the mix can be treated independently. What Is In A Stem? The essential attribute of a stem is that it should be an element of a mix, rather than simply an edited recording of an instrument. The stems are a breakdown of the mix, which when added back together at equal volume create the mix as if you had presented it as a single stereo file. All the stems for a given master should be the same length, so that when lined up side by side your mix elements are perfectly in sync, and they should contain any effects that are relevant to the main content (unless you choose to present effects returns in their own separate stems). The extent to which a mix is broken down is entirely at the discretion of the producer. The simplest example is to have two stems, i.e. vocals and backing track, which then avoids the necessity of multiple mixes such as vox-down, vox-up, vox-up-a-bit-more and so on. This approach goes back to the early days of multi-track tape, when pop music was still consumed exclusively in the format of the mono single record. Although most mixes (or reductions as they were then more usually known) would be mastered onto full-track mono tape, some preferred to make use of the half-track format and keep the vocals and backing track separate so that final adjustments to the vocal level could be left to the disc-cutting/mastering stage. Another example of a basic stem setup would be four stems: vox, drums, bass, the rest. You could look at this as being top-line, percussion, bass & harmony; and having access to these elements could provide all sorts of creative possibilities. Tweaking the bass and drums independently of the rest of the arrangement can be very useful when mastering, especially given that the bottom end of a mix can be very tricky to get right in a project studio environment where the monitoring isn’t necessarily very accurate. The ability to EQ the bass instrument and bass drum individually in the mastering studio can solve all sorts of previously unseen problems and help you arrive at a wonderfully tight, deep and punchy bottom-end. In a more complex stem setup, you might have a different stem for every instrument. This is more common in situations where the producer or mix engineer is viewing the stems more as an emergency or backup option. In this scenario you have total control over the balance of instruments in the mix, but retain the EQ and other effects used in the mix studio. There are a few things to consider when planning your stems. As a general rule it’s always best to keep things as simple as possible, so think about what you want from your stems and only create as many as you need; grouping instruments together where you’re confident in the balance and only separating those elements you’re unsure of. If you’re mixing outside the box through an analogue console, then you should think about the noise content in your stems. If any of your effects returns are noisy for instance, then you should at the very least make sure that you mute returns that are not being used for a given stem. Remember that when you re-combine the stems at the mastering stage, any noise will be compounded as you add each stem to the mix. For this reason alone it’s worth aiming to use as few stems as necessary. Buss compression is another issue; what happens when you have strapped your favourite custom comp across the output buss and it’s doing something wonderful no other compressor will do? As a dynamic process, the compressor will act differently as you mute unwanted channels in each stem, resulting in a stem mix that sounds different to your stereo mix. The difference may strike you as a positive one, but then again it might not. The only way around this is to bypass the compressor when creating your stems, and bring it along to the mastering session so that the buss compression can be re-applied at that stage.